As a sign of global warming! A record-setting snowstorm that dumped nearly 4 feet of snow across parts of the Rockies by Thursday will threaten parts of the Midwest and South today with heavy rain and flooding. The powerful fall storm forced hundreds of flights to be canceled in Denver and closed schools and major highways. Heavy snow fell as far west as northern Utah’s Wasatch Front to western Nebraska’s northern border. In South Dakota, snow shut down the Mount Rushmore National Memorial. A blizzard warning was in effect until morning in northwest Kansas. The heaviest snow was reported in the foothills west of Denver, near Pinecliffe, Colo., with 43.8 inches by midday Thursday, according to the National Weather Service. 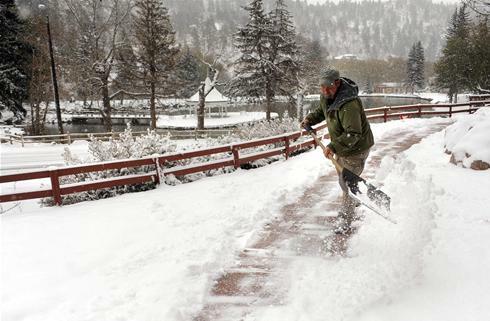 October snow records were set for Cheyenne, Wyo., and Fort Collins, Colo.
“Big storms like these, they seem to come around every 10 to 12 years,” said Kyle Fredin, a weather service meteorologist in Denver. The snow and windy conditions, which began late Tuesday, closed part of Interstate 70 through Colorado, plus other highways. Colorado Department of Transportation spokesman Bob Wilson said no serious accidents had been reported, likely because shuttered businesses meant fewer cars on the road. The area around Denver International Airport received between 11 and 16 inches of snow, the weather service said. United Airlines canceled about half of its flights Wednesday and Thursday, because only two runways were open instead of the usual six, United spokesman Charlie Hobart said. Frontier and Southwest Airlines also canceled flights. The worst of the wintry weather in Denver should be over by today, weather service meteorologist Dan Leszcynski said in Boulder, Colo. But the heavy snow could trigger avalanches, according to the Colorado Avalanche Information Center. As the storm moves east, it will bring up to 8 inches of rain today in some parts of the lower Mississippi and Ohio valleys, Weather Channel meteorologist Mark Ressler said. Flash-flood watches and warnings are posted from Iowa to Louisiana’s Gulf Coast. Much of the area is already saturated. Standing water was reported in fields in eastern Arkansas, Ressler said. •Cheyenne, Wyo., has had 2 feet of snow this month, shattering its previous October record, set in 1906. The average October snowfall in Cheyenne: 4.9 inches. •Fort Collins recorded its largest October snowfall: 21.1 inches. The previous record was 20 inches. •Denver had its biggest October snowfall since 1997, said Byron Louis, a weather service hydrologist in Boulder. In Fort Collins, the snow and chilly weather didn’t deter people from the prospect of a year’s worth of free chicken. More than 100 people camped overnight outside a new Chick-fil-A restaurant Thursday for a chance to win a year’s worth of free chicken meals. They huddled around propane heaters supplied by the store and were invited inside for hot chocolate and cookies just before bedding down in sleeping bags and tents. Winter’s October surprise put a crimp in Halloween plans for outdoor attractions and events in Colorado. The Northern Colorado Corn Maze in Fort Collins was forced to shut down for the season, owner Jason Martindale said. Cornstalks that stood 8-feet tall earlier this week are bent over with snow. “It’s made a mess out of everything out here,” Martindale said.